Facebook Places is barely two months old and it’s already starting to pop up in applications across the Web. We’ve seen it used to promote music and now it’s found a logical home, tourism. Tourist body VisitBritain has launched a league table of the UK’s most popular attractions. 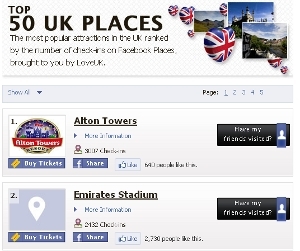 The Love UK Top 50 Places, launched today, ranks tourist spots by the number of Facebook Places check-ins they’ve received. 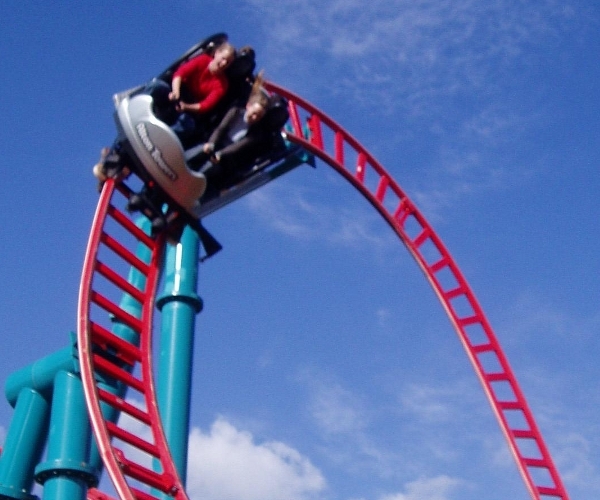 Currently topping the chart is theme park Alton Towers, with homes of football teams Arsenal and Manchester United taking second and third places respectively. It’s still early days for Places, and that’s reflected in the number of check-ins. The top attraction has only 3007 check-ins at the time of writing. That said, with last week’s launch of Places for Android and the ability for third party developers to fully harness Places in their apps, it looks like use of Facebook’s location tool is set to explode. VisitBritain is marketing it as an opportunity for less-known attractions to get themselves noticed alongside the big names. All major attractions can register for the scheme and visitors are being encouraged to leave a review with their check-in. The 50 Places chart is a reminder of how location features in Facebook could be beneficial far beyond the social network’s own ecosystem. With such a vast userbase in place, a new presence on Android and an attractive deals proposition, could it be that the only thing protecting Foursquare from being trounced is the general public’s distaste for sharing their location online?